Sandy Smith welcomed the six members who attended the November meeting: Lee Forbes, Elizabeth Bates, Chrystal Schivell, Jeanne Turner, Cindy Gordon, and Carin Lin. Sandy reported that the Princeton Area League now has 69 members, 10 more than in June. 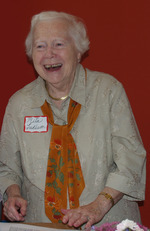 She noted with regret that Rita Ludlum passed away November 4. Over the years Rita was involved in numerous studies (consolidation of the Princetons, finally accomplished), education, environment, immigration, and lots more. Rita was League president 1979-81. Rita was probably best known around Princeton as “Mrs. Voter Service.” She was chair or co-chair of the Voter Service Committee for decades, retiring officially from that position in 2008 at the age of 84, but continuing to mentor others. A tribute to Rita is on our website. There will be a memorial mass at St. Charles Borromeo Church in Skillman on November 24 at 11 a.m. and a celebration of her life for friends and family at Stonebridge on January 12, the time to be determined. 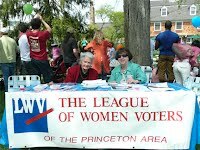 It was agreed that LWV-Princeton Area eliminate the membership fee for students to conform with LWVUS practice. Members of LWV-Princeton Area participated in approximately 20 drives, registering about 150 voters. The drives were spearheaded by Joan Bharucha, Terri Flanagan, Jeanne Turner, Cindy Gordon, Kathleen and Madeleine Moriarity, Ingrid Reed, and Sandy Smith. 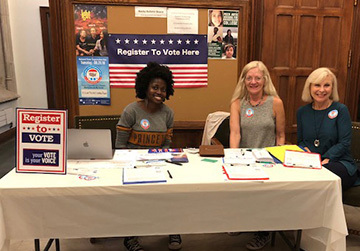 At the Princeton University drive on National Voter Registration Day, members learned from a student about VOTE.org, a site that lets voters register in their home states – especially useful for students. Left to right, Princeton graduate student who organized the event on Princeton University campus, with Sandy Smith and Jeanne Turner. Chrystal reported that in the local races covered by Jeanne Turner, Kathleen and Madeleine Moriarity, Marianne Mencher, Jennifer Howard, Jean Nitzberg, Sandy Smith, and herself, 70% of the candidates responded to the questionnaire. In the county races that she, Jennifer, and our intern covered, 42% of the candidates responded. LWVUS is collecting state-wide and nation-wide data about the number of voters who used VOTE411. On own website, lwvprincetonorg, there were 848 users between October 1 and November 6, with 244 views of the New Jersey Ballot Question and 163 views of the Princeton School Board Candidates Forum video. We discussed the need to sell VOTE411 to both voters and candidates, perhaps coordinating with other organizations like the Good Government Coalition of New Jersey (GGCNJ) but certainly exploring with LWVNJ ways to publicize VOTE411 more vigorously. The forum for candidates for Princeton Board of Education brought out 50 voters, but another 165 viewed the video online. Rebroadcast of the forum was the second most-watched program on Princeton Community TV in October. Three other forums were planned but canceled when some candidates declined to participate. Chrystal summarized some of the positions, posted on LWVNJ’s website, that the League advocates. They include fair districting, voting rights for parolees and probationers, early in-person voting, and a paper trail. Headed by Nancy Hedinger and Dawn Clarke, the committee will update the Voter Service Manual and address commonly encountered difficulties and questions regarding voter service. Some League policies may be changed. Chrystal is a member of the committee; others are welcome. If you have experienced problems or frustrations with registration, VOTE411, or forums that have been created by League policies and procedures, please let Chrystal know. Email the League at lwvprinceton@gmail.com. Sandy Smith again suggested that we consider giving a yearly scholarship of $300 to a student who has helped with local League activities and perhaps naming the award in honor of Rita Ludlum. This will be one of the items on the agenda for the next business meeting on January 8, 2019. 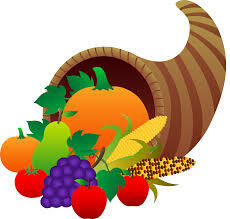 Read more about our November business meeting on our website.